André Diethelm succeeds Andre Le Troquer as head of the Commissariat à la guerre of Free France (France libre). On June 6, 1944, the most remembered D-Day of World War II, the Allies invaded France on the Normandy coast. It was the largest invasion force in history and included over 5,000 ships, 11,000 airplanes, and 160,000 troops. The Normandy Invasion was led by Supreme Allied Commander, General Dwight D. Eisenhower. This was the beginning of the end of World War II. 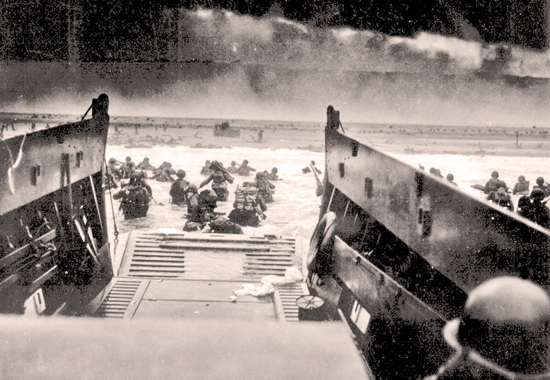 Approx 7,000 allied soldiers were killed on this day. Go here for Franklin D. Roosevelt's D-Day Prayer. Charles de Gaulle gives his speech Paris Liberated. André Diethelm becomes War Minister (ministre de la guerre) of the provisionally government of the French Republic. The Battle of Leyte Gulf begins. This battle will end on October 26, 1944. The Battle of Leyte Gulf ends. This battle had started on October 23, 1944. Charles de Gaulle becomes French ministre de la défense nationale. Edmond Michelet becomes French ministre des armées. The Battle of the Bulge, also called the Battle of the Ardennes starts. This battle will end on January 16, 1945.